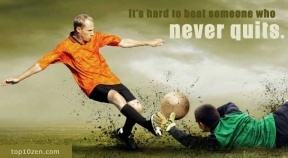 Inspiration can come in many forms, and from many places - but sports, and especially soccer - have a certain "persevering in the face of overwhelming odds" flavor to it that makes it an excellent source of motivational quotes. Recent research has shown soccer to be the #1 most popular sport on Earth, and for good reason. The game is played around the world, is easy to get into, and boasts die-hard fans of the most tenacious variety. Here are 10 of our favorite motivational football quotes to inspire you to greatness. Check out this list of inspirational basketball quotes for more sporting motivation. Born February 1985, Cristiano Ronaldo is a Portuguese professional footballer, captain of the Portugal national team as well as a forward at the Spanish Club Real Madrid. 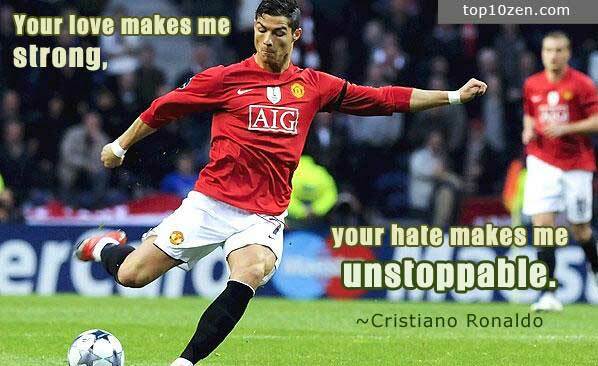 There's no doubt that Ronaldo's die-hard fan-base helps inspire him to greatness, but according to the player, it is his rivalry with Argentinian player Lionel Messi that is his true motivator. Born June 1987, Lionel Messi is an Argentine professional footballer, captain of the Argentine national football team, and plays forward for the Spanish soccer team FC Barcelona. 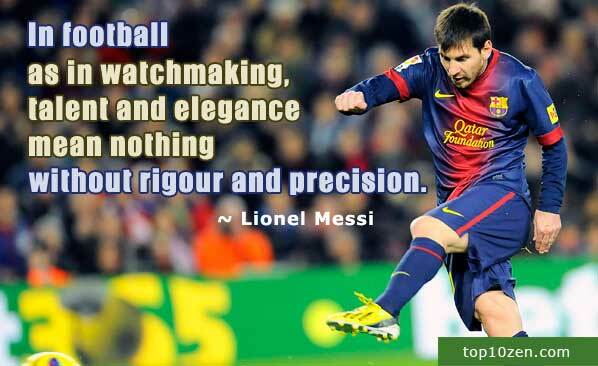 This quote came as the result of Messi's discovery in 2005 of the Royal Oak watch, designed by Gérald Genta for Audemars Piguet. His love of the watch, it's precision and beauty, led him to collect Royal Oaks, and become the brand ambassador in 2010. From the Adidas commercial "My Formula", this inspirational quote embodies the reality of what looks to the outside world as an overnight success. The truth is that hard work and commitment are what makes one successful - the easy way out only leads to failure. The full quote is, "I start early, and I stay late, day after day after day year after year, it took me 17 years and 114 days to become an overnight success. 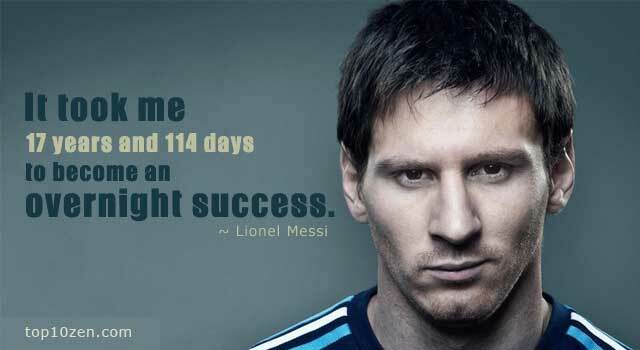 I trained 17 years to be an overnight success." 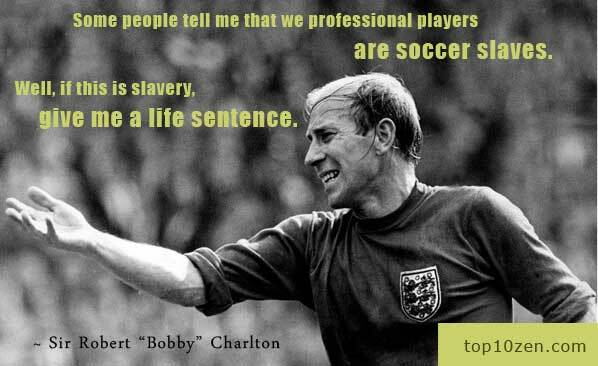 Born October 1937, Sir Robert "Bobby" Charlton is considered one of the greatest midfielders of all time. His career spans an epic journey from playing for Manchester United to being an integral part of the England team winning the World Cup in 1966. 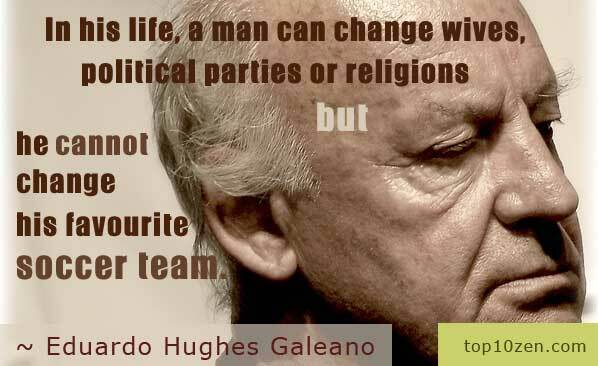 Born September 1940, Eduardo Hughes Galeano is a famous Uruguayan journalist and an avid soccer fan. His desire to become a soccer player never panned out, but his enthusiasm for the game led him to write many soccer-related pieces, among them Soccer in Sun and Shadow (1995), a historical journey into the game.